You may remember that Jonathan and I volunteered in Trenton back in January as part of Disney's Give a Day Get a Disney Day program. Well, we finally decided to use the day we got! We got a much later start in the day than we wanted to, but ultimately didn't miss much. Our vouchers even got us free parking (we don't think they were supposed to), so I was really excited when we started making our way to the park. Redeeming our vouchers at the window was pretty straightforward, although it did take a little more time than I was expecting. Disney has also upgraded to using plastic cards instead of paper, so they don't tear and get wet and mangled in pockets and such all day, which was nice. We even got Volunt-Ear buttons to wear, and several Cast Members thanked us for volunteering. We were also stopped by a couple other visitors who chatted about their experiences volunteering as well. 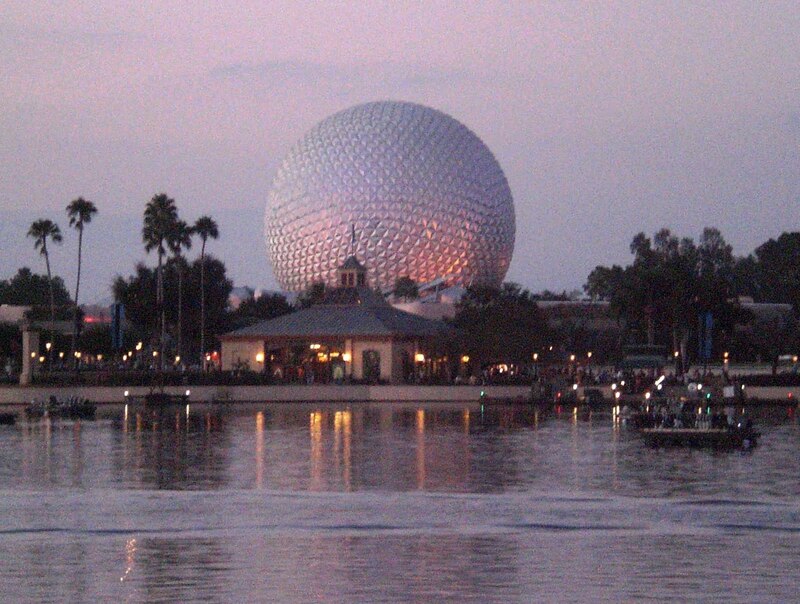 We chose Epcot because of the Food & Wine Festival that takes place in October and November. I had never been before, but Jonathan went a few years ago. As you may already know, about half of the park is a "Word Showcase," featuring rides, pavilions, foods, films, and other things from various countries. During the Food & Wine Festival, additional countries are on display, and each has a kiosk where they sell small portions of authentic cuisine and drinks. This is where the fact that our tickets and parking was free comes into play... we spent about $50 on food and drink. But it was delicious! Everything was wonderful, so we have no regrets. And besides, places like South Korea and Ireland are not at the top of our international travel list, anyway. We entered the park and checked out the Food & Wine Festival Welcome Center, where we picked up passports to be stamped at each country. This is a new thing this year, and I'm really glad that we did it, since it tells which foods you got and it makes for a nice souvenir. If you had an annual pass and went often, it would also help you remember what you've tried if you were trying to sample something from every country. After that we headed to the Nemo ride, because I've heard good things from a lot of people, but had never been on it. We walked right on (well, there might have been a 90-second wait, LoL). It's styled like the Haunted Mansion over at Magic Kingdom, in that you're in a cart on a conveyor belt going through various rooms. However, this is mostly CGI, whereas Haunted Mansion is very little CGI. It was cute, but we were clearly in a car that got the tail-end of the audio, so the timing wasn't the best. It's not really worth riding multiple times, but if there's no wait, why not? We got off and looked at the manatees, which is always fun. Then we went to The Land (Nemo is in The Seas), where we saw that the line for Soarin' was over an hour, and there were no more fastpasses left for the day, so we skipped that. We tried out Living with the Land, where we walked right on. It's a 15-minute boat tour that takes you around to see the greenhouses and aquaculture areas where Epcot gets a lot of the fish and vegetables that they use in the restaurants in The Land. It was pretty neat, and since it would change depending on what they're growing when, definitely worth a repeat trip. We headed to Imagination! where we walked right onto another ride, called Journey into Imagination with Figment. Figment is an animated dragon. The ride is kinda trippy, and probably the worst one we went on all day. If you have kids, however, I bet they'd like it. Figment's jokes are for six-year-olds. We immediately went into Caption EO, which is a 3D film from 1986 that features Michael Jackson as a space captain on a mission, where he gifts music and dance to the enemy. George Lucas was behind it, and there was an interesting making-of documentary that we watched beforehand. We also wandered through Innoventions a bit, but the only cool things had lines, so we passed. If there was time later, we planned to come back and ride the segways and stuff, but there ended up being no extra time.